All dressed up and nowhere to go (but down). High above our earthbound meanderings, black locusts have been casting their white blooms against blue sky. These particular specimens, across the street from us, have trunks dressed up in the nicely contrasting green of english ivy. The effect comes at a price, however. 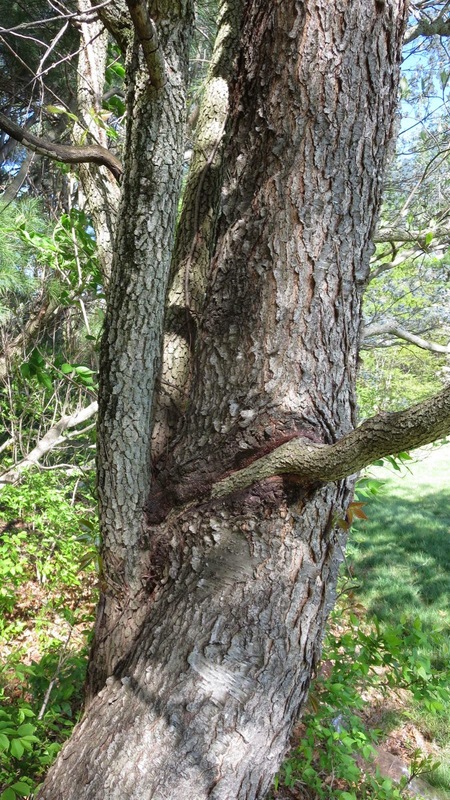 The ivy adds to the weight of the trees during ice storms, and adds resistance during high winds, either of which can cause this to be a short term relationship, resulting in the trees' premature demise. A previous post shows the consequences. Around the corner, one of my favorite specimens of black locust (Robinia pseudoacacia), a multi-trunked beauty along Hamilton Avenue. This morning, Sustainable Princeton will host another in its excellent series of Great Ideas Breakfasts at the Princeton Public Library. This month's program is about water that comes through Princeton in all its forms: precipitation, runoff, drinking water, wastewater. I'll be leading one of the discussion groups, on the concept of resilient landscapes. 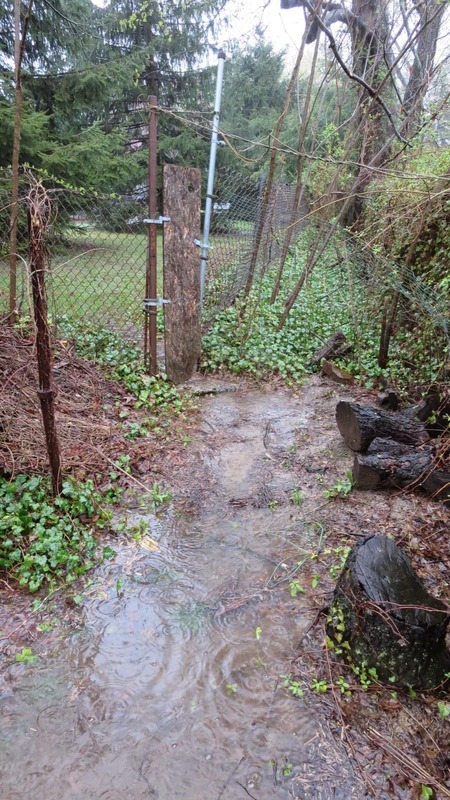 Below are some photos of the stream that flows through my backyard during heavy, extended rains, and how I've harnessed that water to drive a productive and diverse habitat of native floodplain wildflowers, sedges, and (my daughter's contribution) ducks. The water cometh from uphill. In its path lies this normally tranquil scene, with a series of miniponds, a constructed stream channel, native sedges, rushes, and wildflowers building towards summer blooms, and a chicken. After heavy rain falls steadily for a day or so, upstream soils become saturated and begin to shed any additional rainfall. 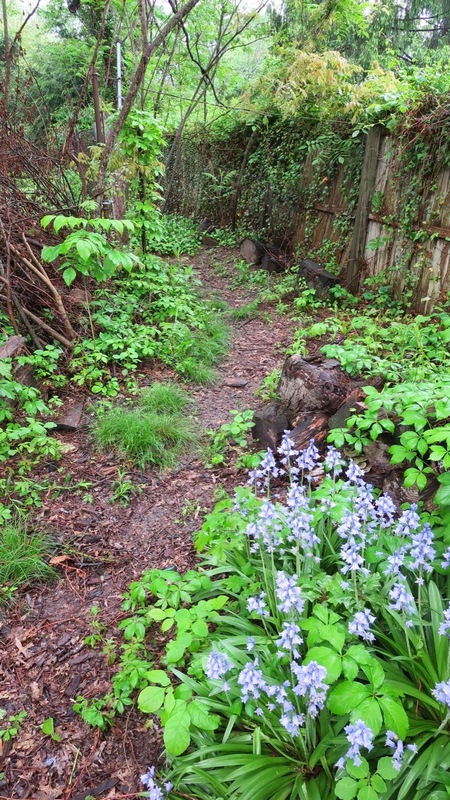 The water begins to flow in from uphill neighbors' yards, bringing this ephemeral stream to life. When the rains stop, the plants will emerge unharmed and replenished, and a little of the runoff will have been held back, slowed down, by the series of check dams and miniponds. Now looking towards the back of the property, a quiet "before" scene: our path to a little town park bordering our yard. And a "during" scene, as rainwater runoff flows from the park into our yard, and gets redirected by a berm so that it will feed our ponds and then flow safely between two houses just down the slope from us. Being ready to accommodate a flood also better prepares a yard for droughts. Slowing the water down allows an underground reservoir of moisture to form, sustaining trees and wildflowers through the dry times. A "fillable, spillable" pond prototype--something of a mockup intended to give the ducks a place to swim during droughts. And, when the ducks have mucked it up the way ducks do, or when the mosquito wigglers appear, it can be easily tipped to spill and refill with clean water. Need to build a rock wall ramp on either side to provide ornament and also a means for the ducks to waddle up into the water. The ducks love the heavy rains. The chickens? Not so much. Growing next to the sidewalk just around the corner is an eyecatching oddity. These should be leaflets of an ash tree's leaf, but instead they bear an uncanny resemblance to a butterfly's chrysalis. This is a normal ash leaf, with a bunch of leaflets. Here, the development of each leaflet has been altered to make the chrysalis-like structure. Sure looks like something should be living inside. The latin name for the midge, a kind of fly, is Dasineura tumidosae. Considerable internet searching yielded no common name other than "ash gall". Here's some more info. One of the more common galls on ash is the ash flower gall, which can be seen in the canopy in the spring, before leaves emerge. Thinking back to our hike up Baldpate Mountain a month ago, I realized we had been looking up at an ash that looked like it had growths on the twigs high up, wondering what it was. 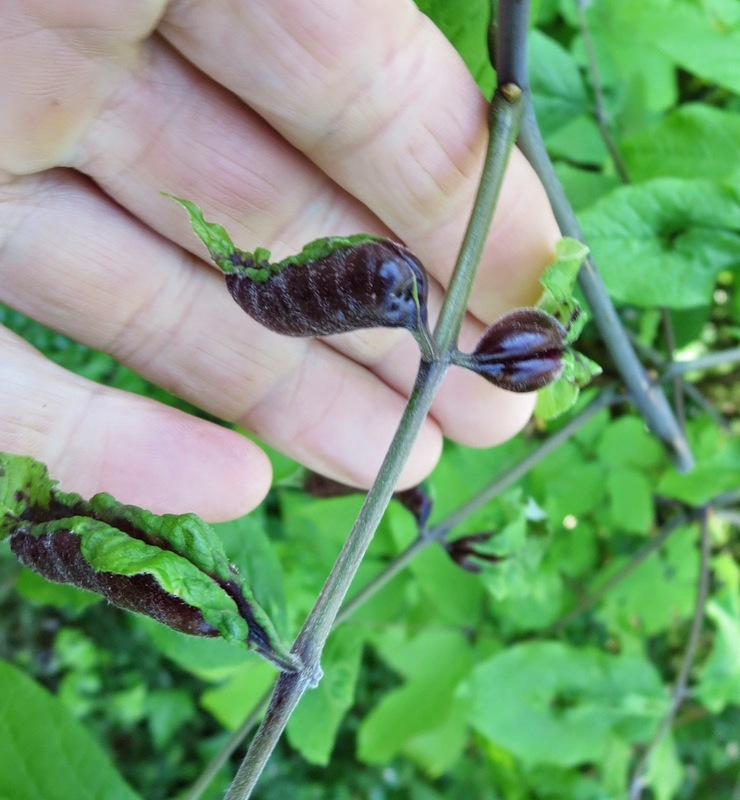 Probably ash flower gall. A question to be asked is how closely tied is the fate of all of these organisms to their host plant. If our ash species succumb over the next ten or so years to emerald ash borer, whose presence in New Jersey was documented for the first time this past week (more on this later), will all of these insect species find other hosts, or disappear along with the ash? A tree like the ash, which can develop considerable stature and grandeur, feeds an entourage of less charismatic creatures. At least one of them I can now count as a neighbor. Bamboo, once it reaches a house's foundation, can actually grow up under the siding. That's what happened next door, as a big patch of bamboo that was providing privacy between homes kept expanding. Realizing his house was threatened, the landlord had it all cut down last year, but there's been no followup to prevent the bamboo from regrowing from the roots. Having dealt with invasive plants for decades, professionally and around the house, I've learned the hard way that the first large scale removal is not the end of the problem, but only the first stage of an extended battle. Usually, the invasive wins. People are highly distracted, while a plant like bamboo is focused 24/7 on growing. While these new shoots are still soft, however, it would be relatively easy to mow them all down, every few weeks until the roots finally run out of energy. How tender grows the bamboo? Ask the Chinese man who scavenges bamboo shoots in the neighborhood and takes them back to his house for some stir fry. People's appetites could potentially play a role in bringing an unruly plant like bamboo into balance with the environment, but it would take a cultural shift, and consistent harvesting year after year. I sometimes speculate that cattail, a highly edible native that can aggressively take over a wetland to the exclusion of other natives, was kept in better balance long ago when it was part of people's diet. The Riverside Elementary PTO brought the country to the people last weekend, for their annual environmental fair and fundraiser. There was Dorothy Mullen--who with the help of many volunteers over the years has nurtured the Riverside gardens to their glorious state--announcing the winners of the raffle. And a small herd of sheep whose wool was being spun into yarn just outside the pen. The sheep must have been wondering why humans don't just grow their own fur. My table, despite being stocked with info-packed books and pamphlets with compelling names like Rain Garden Manual of New Jersey, the Princeton Environmental Resource Inventory, and Princeton's Guide to Leaf Management, lacked a certain charisma until Dorothy's chickens arrived. The event, riding the tide of a perfect day, raised $6000 towards sustaining the garden education programs that have become an important part of school curriculum. In the words of lead organizers Beth Behrend and Julie Capozzoli, the event helps "provide all of our children with lifelong lessons in nutrition, healthy living, sustainability, hands-on learning and much more"
Carolina wrens have been dominating the airwaves around the house this spring. It took me back about twenty years to when there was a very long winter in Michigan. In Ann Arbor, low grey clouds can stream overhead for weeks on end, and by March the drab landscape of grey sky and brown landscape leaves everyone color deprived. I got so desperate for some sign of spring that I went to the library and checked out recordings of birdsongs. Some sort of bonding must have taken place, because for several years after that, I wrote little tunes based on birdsongs. It was nice of the birds to donate their melodies for the purpose, without any copyright restrictions. The first piece I wrote was based on the song of a Carolina Wren. If you play the slideshow/recording below, you'll hear that a Carolina wren in Michigan sings four triplets in a row. In our Princeton backyard, the wren was doing five. Maybe the east coast wrens are more packed in, and feel a need to go on a bit, to let everyone know who's who and where's where. A few weeks ago, we started hearing some peeping in the carport as we entered the house, but couldn't figure out where it was coming from. I finally pulled out a ladder, and started looking in various places above the door. You can see the orange inside of their mouths, ready and waiting for dinner. Around the time I got to wondering when they'd fly, the peeping stopped, and a quick scan of the driveway outside the carport revealed one young wren trapped in the back of the pickup truck, having made its first flight but not quite ready for its second. The parent was close by, keeping an eye on me. Many environment-related events this weekend! 5/17 from 10-2, the fourth annual Healthy Kids, Healthy Planet event takes place at Riverside Elementary in Princeton. I'll be there to talk about raingardens and plants in general, Dorothy Mullen, who has done so much to make the Riverside garden part of the school's curriculum, "will be doing salad dressing tastings, seed planting, garden tours, delicious local foods (Bent Spoon, Whole Earth Kale Salad and Terra Momo sandwiches again! ), fun crafts, family yoga classes, edible insects (alternative protein! ), sheep, rabbits, chickens, a basket raffle, local green exhibits, over $3000 in sponsors and lots more." 5/17 and 5/18, at 8am, Two birdwalks at the Institute Woods. 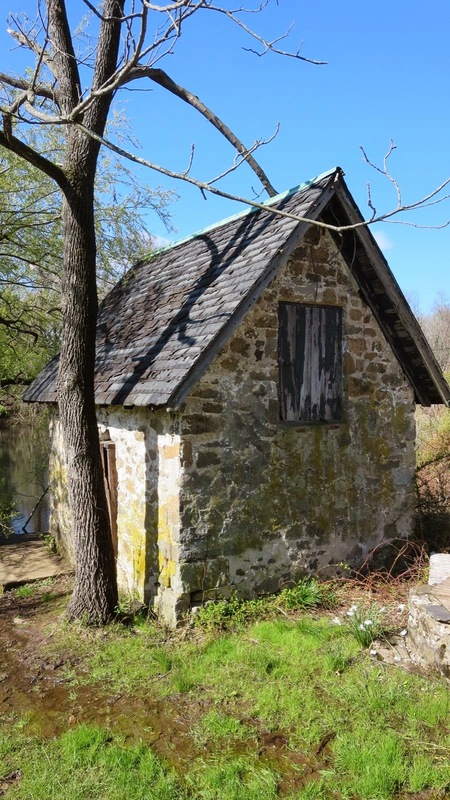 (Starts at Rogers Refuge) "The Institute Woods near the Institute for Advanced Study is an excellent place to observe the spring migration of warblers and other songbirds. Two dates are offered so that you can pick the most convenient for you." Directions and contact info at this link. 5/17, noon to 2pm: SolarJam 2014: Local Student Solar Fair Princeton area's first ever student solar celebration, “SolarJam 2014,” will be held at Princeton High School. Nine area schools are sending teams of students from 3rd-11th grade who have built either solar mini cars or created passive solar projects. The solar mini cars will participate in a fun race. The event is sponsored by PSEG and organized by OASIS (Organizing Action on Sustainability In Schools), a local non-profit school consortium. 5/29, Great Ideas Breakfast – Water: Our Most Undervalued Resource, 8:30 AM to 9:30 AM at Princeton Public Library. Presentation by Stonybrook Watershed Assoc, on what can we as residents do to conserve water and maintain the high quality we expect for the health and well-being of our families and our community. After the brief talk, I'll lead the discussion group focused on utilizing runoff in the yard to feed raingardens and other plantings. Yesterday, the gravitational pull was felt strongly in nature. Oak catkins and spinning maple samaras fell pell mell to the earth, as if on cue. Our chickens and ducks too offered a unified response by each laying an egg. A "four eggs day", I like to call it, with each egg different in size and color--a reminder of what life was like before industrialized agriculture taught us to expect uniformity. Left to right, we have the fine creations of Buffy, Buttons, Molly and Daisy. 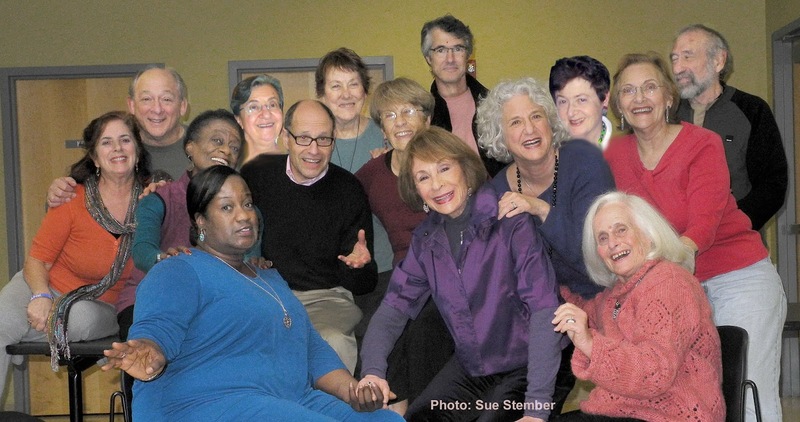 Later in the day, at the Princeton Public Library, famed author and local resident Joyce Carol Oats offered some fresh creations of her own. Though the reading was to be focused on her recent novel Carthage, she quickly turned to the memoir she is currently working on. It doesn't sound quite right to say that chickens loomed large in her childhood, because even as a little girl growing up on a farm, she would have risen well above them. But an extended portion of her reading described the special chicken she developed a deep connection to and called "Lucky Chicken". At a very early age, she believed that the rooster's call opens a crack in the world through which the next day can enter. She told of that special feeling a child can have, never to be found again in life, of the chickens rushing to her as she approached with their feed. A child can learn a great deal about the emotional dimensions of life from being around chickens, experiencing love and loss, and even evil. She had said during her reading that probably no one in the audience had ever fed chickens, so I felt obliged during Q&A to announce that we have chickens and ducks and that Princeton allows this, as long as the neighbors are happy. She said that she'd be worried about foxes and other predators, and I explained that we have a "guard duck" that seems to intimidate the hawks, which are the main daytime threat. "But do you have a rooster? ", she asked. No roosters allowed in town, I replied. "You have to have a rooster. ", she said, speaking perhaps more metaphorically than literally. She went on to say that her sense of evil lurking in the garden of life came from roosters. She was a shy girl, and treated the chickens well, but even so the rooster would peck and claw at her, drawing blood. With that, they segued into the book signing portion of the evening, at which point I headed home to make sure the chucks and dickens were safely in the coop for the night. Princeton Battlefield in early May, where patches of blue Ajuga sneak in some blooming time before the first mowing of the historically incorrect but pleasing to walk on lawn. Look across Mercer Street from Mercer Oak, Jr., and scan the wood's edge to the left and right of the pillars. This time of year you will see many flowering dogwoods living up to their name. It's an easy observation, but that doesn't necessarily mean anyone has noticed. 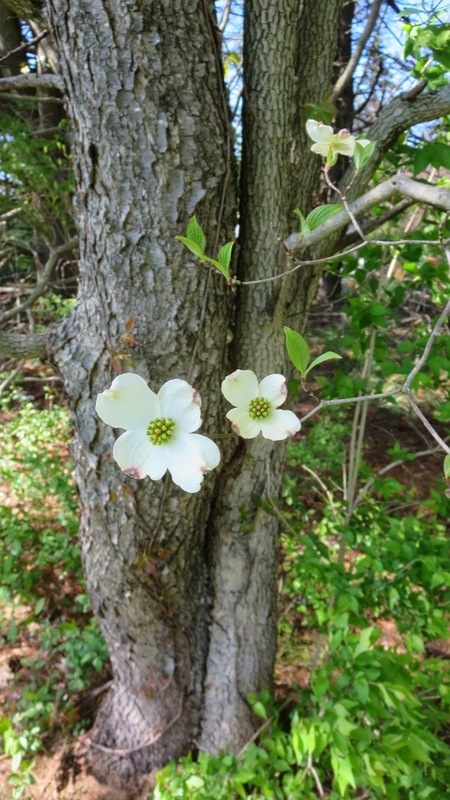 A closer look reveals a fairly regular pattern to the dogwoods--every ten feet or so. It's almost as if (which is to say it's almost certainly the case that) someone intentionally planted these dogwoods long ago to honor this hallowed ground. Having worked as a horticulturist (during which time I learned many valuable things, including that horticulturist is not pronounced "horticulturalist"), my impulse is to make sure the dogwoods are not being overgrown by surrounding trees and vines. Here, a white pine branch is jutting out, stealing sunlight from the dogwoods. Cut the branch and the pine tree will be unaffected while the dogwoods will greatly benefit from the extra sunlight and room to grow. And this black cherry really should be cut down, except for one small matter. Ignore the young, reddish poison ivy leaves on the right, and you'll see a most unusual phenomenon. The black cherry tree appears to have borne the branch of a flowering dogwood. On the backside, you can see how the black cherry, growing in intimate proximity to the dogwood, has completely absorbed the dogwood branch into its trunk. I think I'll just leave them alone and take my horticultural proclivities elsewhere. These two trees look to be made for each other. 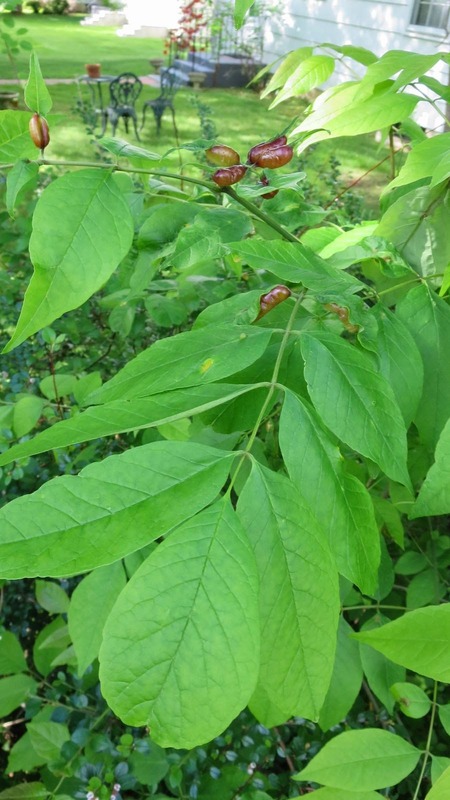 A post from 2012 includes photos of the porcelainberry vines that nearly smothered some of the dogwoods before I intervened with a pair of loppers. 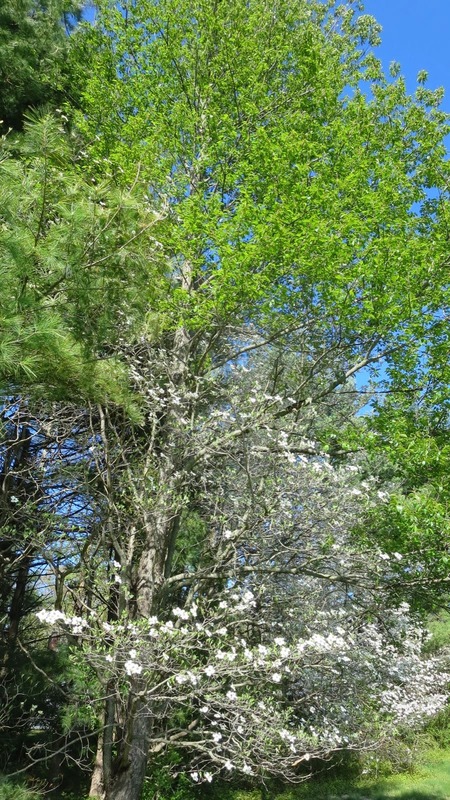 Also, for anyone headed out that way, there's a great woodland display of flowering dogwoods along Cherry Hill Road where it crosses the Princeton ridge. The passing of Paul E. Sigmund, a prominent scholar in the field of Latin American politics, prompts me to post about the park dedicated in memory of his wife and former Princeton borough mayor, Barbara Boggs Sigmund. The park's perennial plantings have long added beauty to a drive along Hamilton Ave., but are now at risk of going into decline. For years, Polly Burlingham led volunteer efforts to sustain the plantings, but she found it increasingly difficult to find volunteers, and so has moved on to other projects. Currently, municipal crews do periodic cleaning of the park, but perennial flower beds require knowledge--or at least the sort of affection for plants that leads to that knowledge. 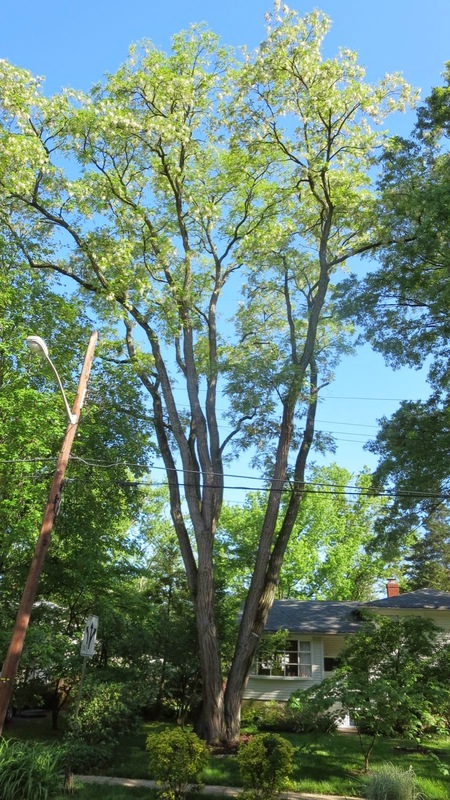 Though Princeton has an arborist, there is no one on staff responsible for knowing anything about the kinds of plants that, through no fault of their own, don't happen to have trunks. The only tools Princeton wields to care for herbaceous plants, as far as I know, are a lawn mower and a weed whipper. 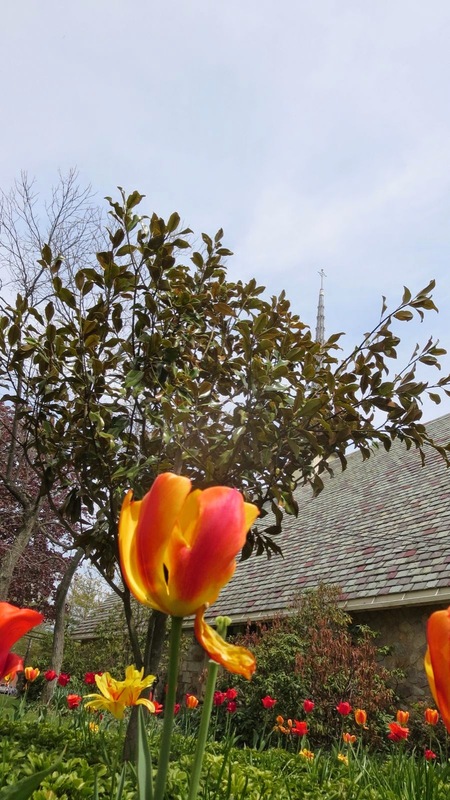 Well-meaning efforts to beautify Princeton with something more than trees and turf, whether at Sigmund Garden, Harrison Street Park, or elsewhere, are therefore threatened the moment they are planted. 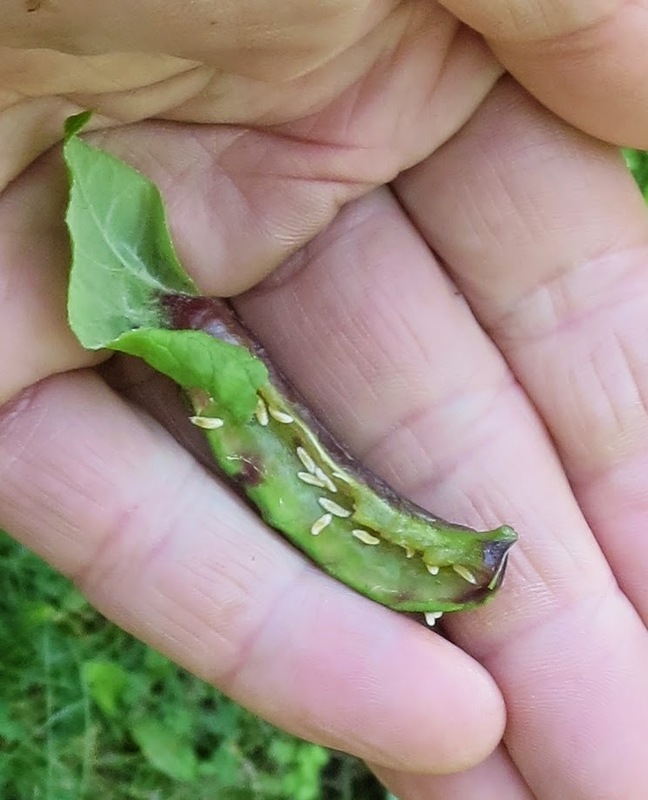 Without knowledge and t.l.c., the intended plants get pulled out along with the weeds, leading to steady attrition until the whole thing gets mowed down and returned to lawn. Here's one of the flower beds at Harrison Street Park, several years after some $30,000 worth of perennials and other native plantings were installed. Some of the wildflowers, like the woodland asters in the back left, are hanging on, but moving in on the lower left is the dreaded mugwort, and the white in the middle is garlic mustard beginning to overwhelm the intended species. 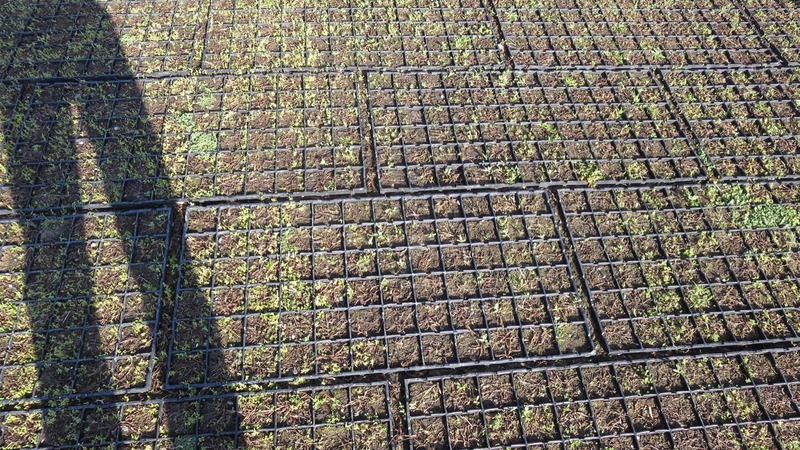 The plantings are still at a stage where they could be rehabilitated relatively easily. When I alerted town officials last summer to the sad state the plantings were falling into, a private landscaper was brought in to do some rehab. But that was a temporary fix. The Harrison Street Park neighborhood was originally expected to tend to the plantings, and there are many residents there who would be willing to help. But they'd need to be organized, and led by someone who can point out what to pull and what to keep, and it's asking a lot for someone in the community with the necessary training and organizational energy to step forward year after year and donate leadership, expertise and commitment. The underlying problem, plaguing society far beyond the plant world, is a misapprehension of maintenance. People believe that creativity ends with installation, but most anyone who gardens understands that maintenance itself, like parenting, is a creative process. Plants are shifted to better locations, new species are added to fill gaps and add new colors. Judgements are constantly being made about what to pull and what to leave. 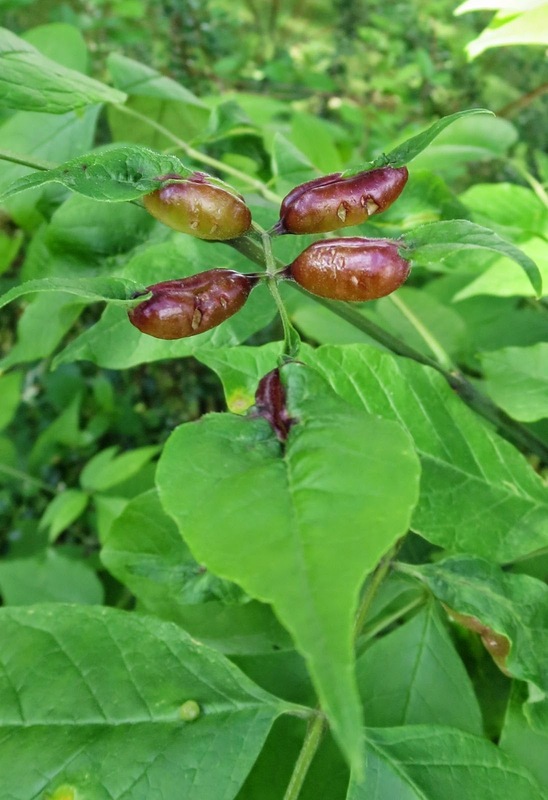 Invasives--the bullies of the plant world--are caught early on before they take over. All of this requires knowledge, experience, judgement and persistence far beyond the design/install stage. And yet its the initial design and installation that get the funding and recognition, after which people walk away, ribbons cut, awards given, thinking their job done. Unlike a newborn baby, plants don't have the vocal chords to make a commotion every time they need attention, and this seems to be their undoing. The woodland asters at Harrison Street Park suffer the deepening shade and underground chemical warfare of garlic mustard in silence. Empathy--the capacity to intuit and respond to what is not being explicitly stated--is as important with plantcare as it is with people. Come to think of it, the word "character" sounds a lot like "care-actor"--someone who not only cares but also acts--a useful thought when considering citizenship in general, and the caretaker's role in particular. It would, of course, be great if someone in the community stepped forward to take the lead on caring for these plantings, just in case this post doesn't prompt immediate institutional change in how parks are managed. Princeton Recreation would be the department to contact. Here and there in Princeton, you'll find populations of wild tulip. That would be the yellow one on the right in this photo. Though it's called wild, it's not native, and only grows in "wild" areas of people's yards. What it lacks in flamboyance it makes up for with an elegance and grace not always found in the more domesticated forms. 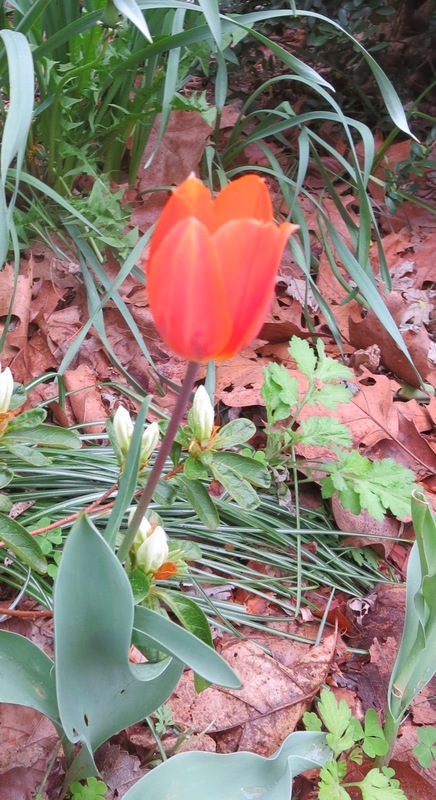 And here's the more casual look of the wild tulip, which unlike other tulips can spread. These were planted along Nassau Street near the intersection with Harrison, and look a lot better than grass this time of year. 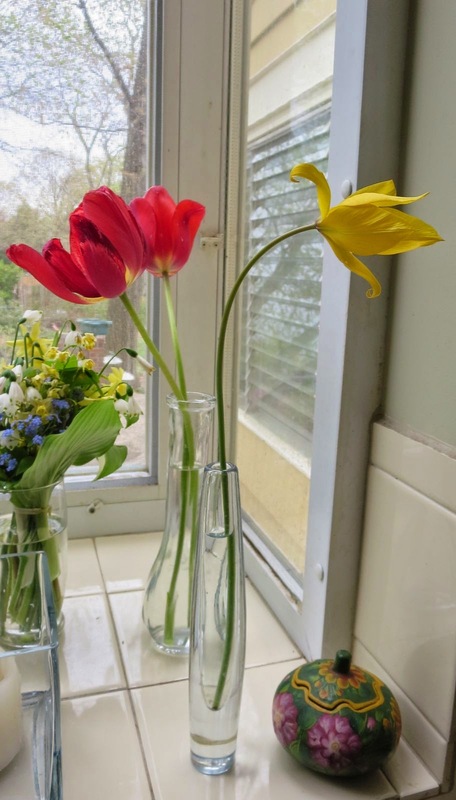 The tulips I remember from childhood were like neither the wild tulip nor the large varieties sold today. They grew along the driveway in my parents' garden, came back year after year like old friends, and had a poignancy that may have had to do with their smaller size, tight form and rich, subtle colors. Rather than massed, each tulip was an individualist, unique. A friend turning 60 invited fellow nature lovers near and dear to join her for a birdwalk up wooded trails to the highest point in Mercer County, Baldpate Mountain. Located near Howell History Farm, it's about a 25 minute drive from Princeton. The turnout on a glorious day was such that we split into two groups, with Sharyn Magee leading one, and Tyler Christensen leading the other. Tyler is featured in the documentary Field Biologist, which had its premier this year. As we gathered in the parking lot, most eyes and ears were trained on bird life in the surrounding trees, but the pervious pavement silently holding us up caught my attention. There's a lot of it, so to speak, and its installation is much more elaborate than its simple appearance would suggest. Pervious pavement--the sort that lets water filter through it--doesn't accomplish much unless the soil underneath is pervious, too, and that can mean bringing in a lot of pervious material to underlie the pavement. The most striking feature of the forest this time of year is the lush layer of shrubbery greening up ahead of the trees. This is the ubiquitous "second forest", the layer of species--multiflora rose, barberry, honeysuckle, privet--imported from other continents that now dominates beneath the native trees. I bet the megafauna would have devoured it, but they're all gone, and all we have at this point is deer, and they aren't biting, so the "second forest" forms a largely inedible blanket over the land. Here and there are toothworts, bellworts, rue anemones and other remnants of the glorious legacy of spring ephemeral wildflowers that would have once carpeted this slope. The way it worked was that the wildflowers would come up early and opulent in the spring, flower with abandon, set seed and store up enough solar energy for the next year, all facilitated by the trees' delayed awakening. By the time the tree leaves cast a dense shade, the wildflowers were already fading back into the earth to remain dormant until the next year. It's a fine recipe for diversity, with the big, dominating woody plants auspiciously holding off on hogging the sunlight until the diminutive wildflowers get a good dose. The nonnative shrubs, having evolved a different timing on other continents, throw a wrench in the works by leafing out early. But this was a bird walk, so even plant people like me eventually trained our eyes skyward, at first to see how the white oaks managed an uncanny imitation of shagbark hickories further up along the trunk. Many kinds of birds were heard, and some seen, such as the blue-headed vireo and the black and white warbler, agile in their kinetic search for insects high in the canopy. Tyler turned out to be a talented imitator of birdsongs. Perhaps most talented of all were the birds themselves, using their small size to advantage as they maneuvered deftly from one twig to the next, snapping up whatever insect life the vaulted canopy had to offer. My contribution was spotting a small, round nest of unknown make, about ten feet off the ground. and a richly patterned view of the pond from the other side. 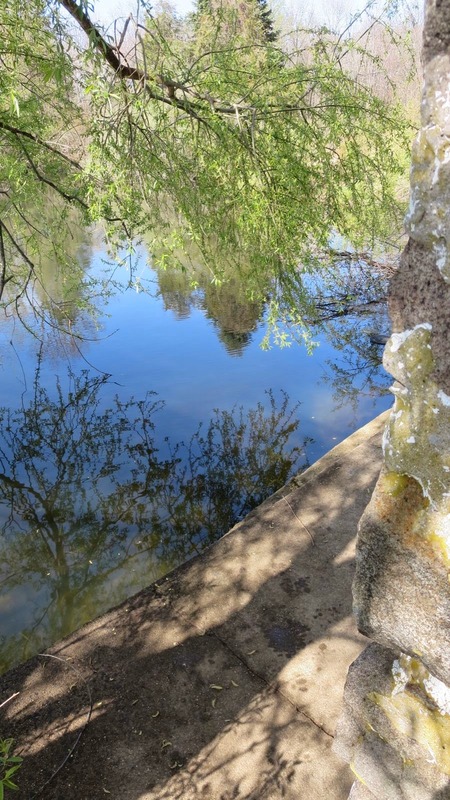 What a treasured spot is a natural spring, and this one like others I've encountered was but a few hundred feet down the slope from the ridge. The farm house, made of wood rather than stone, has suffered the usual double whammy of vandalism and institutional neglect. The farmstead and much of the mountain is owned by the county, which chooses which buildings it will put to public use and lets the rest go into decline unchecked, until they become hazardous enough to demolish. This distant view of the farmstead would have included a big barn until a couple years ago. I've heard that the county tore it down without notifying those who had wished to deconstruct it in order to save and reuse its beams. Where some see history, value and opportunity in historic structures, a government tends to see liability and burden, and views demolition as progress. and finally to a view of the Delaware River. Down the slope is a complex of buildings, including a lodge and visitors' center, into which public funds were poured for high end restoration, including a roomy patio overlooking the valley. The old cistern still holds water. I had thought that black vultures perch only on neglected buildings, but these two prefer an upscale perch, at least on weekends. While others sought a glimpse of the elusive pine warbler, I checked out the wildflower garden just beginning to awaken. It was a glorious day spent on high ground, and a fine way to celebrate 60 years filled with nature and friendship.